← Travel Insurance: Don’t Travel Without It! Mountaineering in the Alps: Experiences for All Levels! The European Alps are the birthplace of mountaineering. Early pioneers including Horace-Bénédicte de Saussaure and Jacques Balmat in the 18th century and Edward Whymper in the 19th century conquered the most famous peaks including the Mont Blanc (de Saussure and Balmat) and the Matterhorn (Whymper). These two mountains are still serious endeavors and should only be attempted by experienced alpinists! 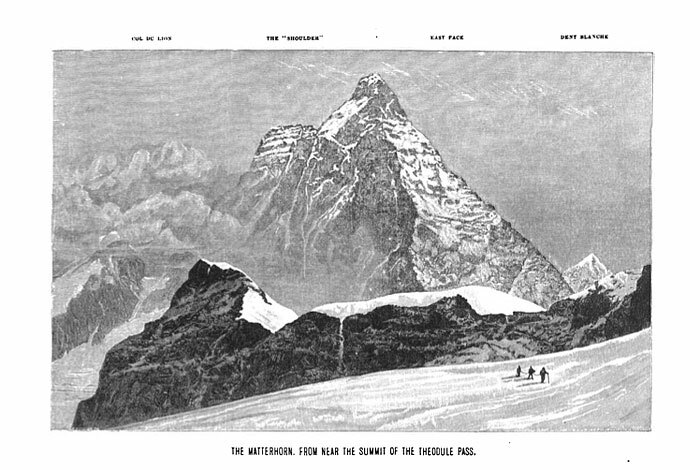 Read Whymper’s “The Ascent of the Matterhorn” online or download it to your e-reader (from Project Gutenberg)! The Chamonix-Mont-Blanc tourism office has prepared a helpful brochure on the serious nature of a Mont Blanc climb (it can be downloaded by clicking here). Beginning and aspiring mountaineers can climb these peaks with the help of a guide and even many experienced mountaineers will wish to have the safety and experience of a local guide. Our 7-day Climb the Mont Blanc itinerary is great for safety, acclimatization and value. For a more moderate itinerary suitable for fit beginners with a little bit of glacier experience or intermediate mountaineers, we recommend the 8-Day Summer Haute Route Glacier Trek. Ask us if you need help choosing a glacier trek or mountaineering experience. Keep in mind that it is essential to know your mountaineering skills before selecting a trip. It is better to select an easier trip if you don’t know how to assess your abilities. This entry was posted in Alps, Europe, Trekking. Bookmark the permalink.